The prize for the Best Timelapse category in the APA 2nd Annual Short Video Contest http://tinyurl.com/apavideo is the eMotimo TB3 Black. Having all the photography toys in the world isn’t going to help a mediocre photographer become great. Put the right equipment in the right hands, and amazing things can happen. 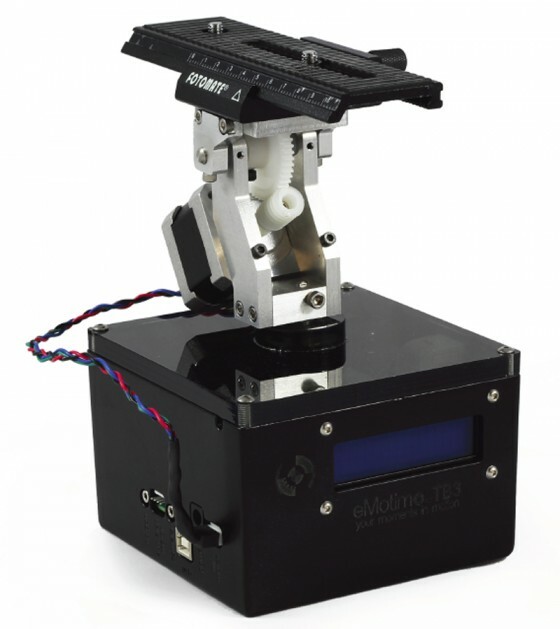 eMotimo crafts the highest value multi-axis motion control head available. Specializing in repeatable, 3-axis moves for both video and timelapse applications, the eMotimo TB3 is affordable (starting at $799.00), portable, and ridiculously easy to use. On a mountaintop, or in studio, eMotimo makes professional capabilities like moving time-lapse, repeatable motion, and precision moves part of your arsenal. eMotimo is proud to sponsor the Timelapse portion of the 2013 APA Short Video Contest. In fact, we’re thrilled! Coming together to share ideas and content is something we value highly here at eMotimo. We see this contest as an opportunity to learn and grow as a community. We can’t wait to see what you come up with and we are excited to hear your suggestions for new tools to empower you in the field. We are confident that this competition will generate stunning results and start some great conversations! Hard work, experimentation, and the willingness to push past the norm, are qualities we try to embrace at eMotimo. We will be looking for these qualities in the Time Lapse category. TB3 stands for “The Box” 3-Axis. It is the next evolution of the eMotimo Pan and Tilt motion control heads. The TB3 has a milled aluminum head with new geometry. It is strong, lightweight, and it puts the pan-axis nearly on-node with most cameras to turn a heavier setup. You may easily add an additional stepper motor to the powered AUX Step port on the side of the TB3 to get 3 axis moves. Additionally, it has a configurable I/O port that allows for 3rd party solutions. Interested in winning a TB3? Check out APA’s 2ND Annual Short Video Contest for 2013 at www.tinyurl.com/apavideo.